Like the proverbial two ships passing in the night, on Saturday night, the surging Florida Panthers visited the Garden to face the struggling heroes in Blue. After a slow start., Florida came into the game on a 7-2-1 streak to face the Rangers, who after their 7-1-1 start were 4-8. Also, Florida was finishing a 3 game in 4 night road trip with successful stops in Buffalo and a Friday night OT victory in Detroit during which they lost 2 players to injuries. Meanwhile, the Rangers had been home all week and had not played since their loss to the Capitals on Tuesday. sport where scoring is even more rare if your name is not Prospal or Gaborik. So, taking into account the negatives for Florida -- tired team, new injuries, back-to-back road games and the Ranger positives -- a rested team that had been practicing hard on power play and puck possession, you figured the Rangers would be at least competitive if not win this game outright. And you would be wrong as the Panthers came out flying and dominated the game and ice for the first 50 minutes before prevailing 3-2. The Panthers, a 93 point team last year, have now surged into playoff position after a 2-7-1 start. The game had that numbingly familiar pattern we have seen all too often recently. Rangers score first despite being outplayed and outshot and outhit, Henrik keeps the team in the game for a while before letting in one or two fluky or soft goals, Prospal or Gaborik score the Ranger goals, the defense yields several odd-man rushes and then commits a fatal error that puts the Rangers behind for good, then the Rangers pick up the pace and press for the tie but ultimately lose in regulation. Unlike last year, these types of games against the Panthers, Caps, Thrashers (the latest conquerors in the Rangers’ 3 game home losing streak would go into OT, thus providing the Rangers with at least a point. This year, the Rangers cannot get the games into extra time or pull out a late game victory. The game against Ottawa – the Rangers’ last win – in a shootout was the type of game the Rangers played often last year and stole points (think about the 2 shootout wins against Pittsburgh at the Garden). The Rangers are not getting to overtime in close games and have only gathered 8 out of the last 28 points. (iii) Avery did not get a penalty for goaltender interference. The Bad : Avery had just finished failing to convert a chance to score on an empty net. The official recap to the game is here. The killer sequence of the game occurred in the 2nd period when the Panthers scored twice within 2:13 to change a one goal deficit into a one goal lead. 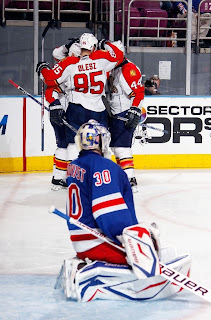 One goal, scored by Jonathan Leopold, was depressing to watch because the Rangers had 3 men in front of Henrik but incredibly let 2 Panthers behind them sunbathing in the crease. The shot went in thanks to a couple of weird bounces but Henrik also did not have his pads square as the puck meandered between them for the go-ahead goal. 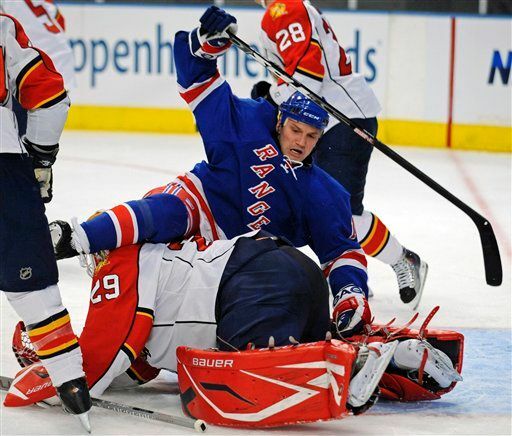 Unlike the Rangers, the Panthers were willing to toss any errant puck at the net. The Panthers’ 3rd goal, created by a giveaway in the neutral zone, saw the Panthers fly into the zone on a 2-on-1 which Henrik successfully foiled only to see Nathan Horton, unchecked by either Staal or Girardi, trail the play on the right side to convert a rebound for a 3-1 lead with 17 minutes left in the game. Gaborik scored within 4 minutes later to make it a game (his 9th 3rd period goal out of his 16 goals this season). With this latest loss, the Rangers are now in 9th place in the conference. If the Pens were not stumbling because of injuries and the Devils had not just lost 3 in a row, the Rangers conceivably would be 10 points out of first – before Thanksgiving. It’s not worth rehashing the ins and outs of the game because the recap is accurate. In fact, after these 3 straight losses at home (interrupted by the shoootout win in Ottawa), the challenge is to find something positive about the Rangers. Let's give it the good old college try . . . The question for the team was who would step up with the injuries to Drury and Dubinsky. The answer – Vinnie Prospal, who has played center, and has scored 22 points in 22 games. No one else has filled the void and noticeably the defense, which was scoring at a torrid pace earlier (nearly 2 points a game at one point) has nearly disappeared from recent scoresheets. It’s not for lack of trying – those two plus the line of Avery, Parenteau and Anisimov – played quite hard with some nice energy but could not convert. Avery went strong to the net several times and could not convert a puck sitting on the doorstep to a net vacated by Tomas Vokoun. 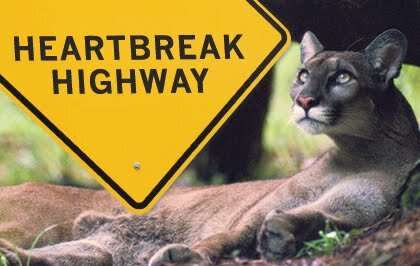 That one could have put the Rangers up 2-0 (another problem with the Rangers -- an inability to extend a lead) and taken some wind out of the Panthers. He played with more energy and more of an edge throughout the evening and later had a golden opportunity to tie the game in the final 3 minutes but was denied by Vokoun. Christopher Higgins again cannot buy a goal and he made several strong rushes to the net and had some nice shots at Vokoun. The fact that none of these guys can score played right into the hands of the Panthers who focussed their efforts at tying up Gaborik, who did not have a shot until he got his goal in the 3rd period. The MSG announcers marvelled at the overall team speed of the Panthers. They reminded me of the Rangers way back in early October. They also referred to a team-wide slump. It’s also become a mental issue because I counted more than a handful of shots that Rangers did not not take immediately when the opportunities presented themselves. Callahan and Del Zotto (especially) took their time and even hesitated for a moment to shoot. In each instance, a Panther was able to get into position to block or deflect the shot. Both players looked to be guilty of trying to set up a perfect shot instead of just letting the puck fly to let rebounds create havoc in front of the net. The team is obviously pressing. 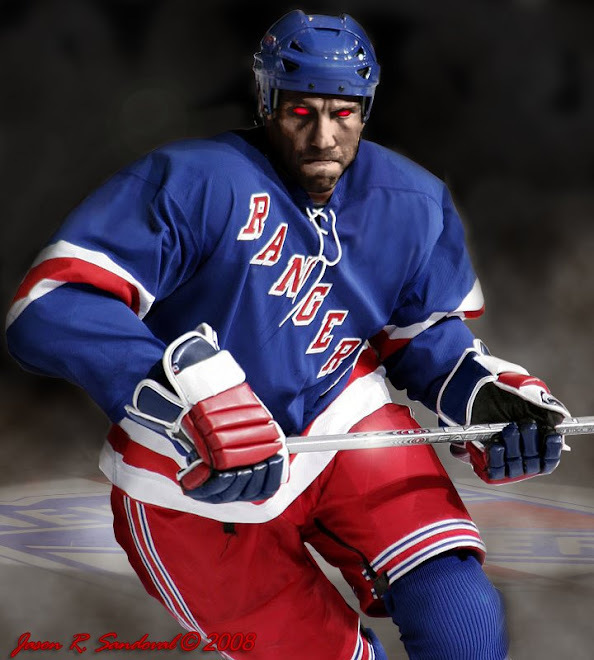 During the final ten minutes of the game, the Rangers buzzed around like they did at the beginning of the season. Why they are unable to show that energy more consistently is a mystery. Statistics do not lie. Henrik is 3-7-1 over his last 11 starts and is good for one or two bad goals per game as well as sticks broken in frustration. (Contrast Henrik with Tomas Vokoun who is now 5-0-1 and has steadily improved since his early bad play.) The Rangers power play, 22nd in the NHL, is in the midst of a 4 for 18 slump. Callahan has one point in his last 13 games; Lisin is scoreless for 9 games. It is conceivable that when December 1 arrives, the Rangers could be solidly in last place in the Atlantic and looking up to 8th place in the Eastern Conference. If that happens, the time will be fast approaching for management to consider taking some steps to turn this into a true rebuilding year. There’s no doubt that the injection of youth has been helpful for the team. Players like Del Zotto, Gilroy, Anisimov, Lisin and even Parenteau are getting a meaningful education on being an NHL-caliber player. We can plainly see how other players have no future on this squad, their contracts notwithstanding. Despite what I have seen, I get the feeling that the hard work of the forwards is about to pay off. I hope I am right because the timing could not be better as the Rangers are about to embark on a 5 game in 8 day stretch starting tonight with a home encounter with Columbus and then move on to Florida for games against Tampa Bay and the Panthers and a back-to-back with the Pens. Going 3-2 would be a good start for recovery at this point. It's too early to be a make or break period, but the next month will go a long way to determining what type of stretch run we will see. Well said. How do you say the same thing over and over again with this team? I cautiously am making my way to The Garden right now wondering what team will show up tonight. My bad luck charm guest (because they lose every game he joins me) may be the spark we need tonight. If we win, then he's coming to every game. Keep giving that guy tickets. You always ride a winner. . .